In a busy Ebisu shopping street where low-budget lunch places flaunt their options on display boards, Kadota is easily missed, as it’s hidden in a basement with minimal signage. It doesn’t need to advertise, as a queue of local office workers forms from noon for this busy, fast turnaround teishoku (set meal) joint. On arrival you’ll be presented with a menu of just over a dozen options written entirely in scribbly kanji – even the prices are written in in the same way. Don’t be put off, as most of the set meals cost ¥1,080; the pricier few are towards the bottom of the list. 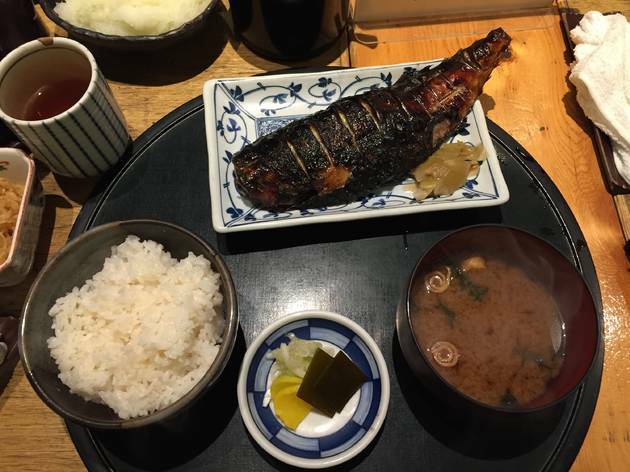 Options include saba (mackerel) either salt-grilled or brushed with a miso sauce; sake (salmon); or meaty swordfish, among others. Order in Japanese, if you can, as the manager is always in a hurry – you are even sometimes expected to order before sitting down. Service is brisk rather than brusque though; your food arrives very quickly, you eat, you leave. 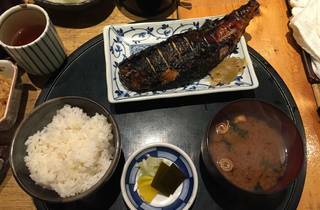 But the quality of the rice, the excellent quality of the seafood and its perfectly blackened skin, richly-flavoured miso soup and pert pickles are all sublime. As you place your chopsticks down your empty tray will be whisked away and the handwritten bill arrive, but you won’t care – you’ll have just had the best, and best-value, teishoku lunch in Ebisu. Dinner prices are higher, but still good value even though the table-sharing continues in the quieter evenings.